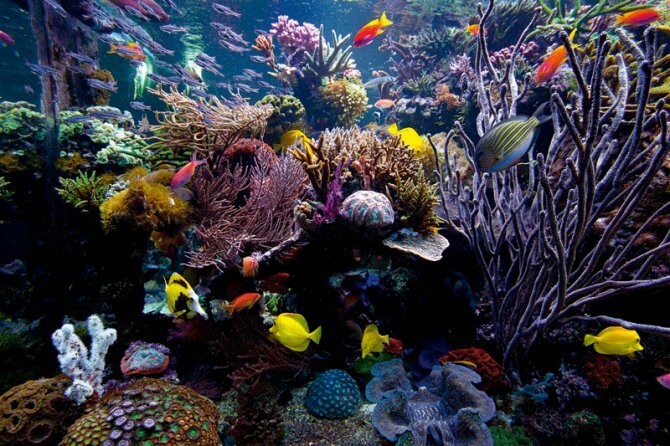 David Saxby's enormous reef tank is possibly the world's most famous privately-owned aquarium. It's 13,640 l/3000 gal. and there’s over a ton of live rock in the tank. The tank’s pumps turn over more than 191,000 l/42,000 gal of water every hour – enough to fill a bathtub in just five seconds. The aquarium is an L-shape, 3 x 2 x 1.5m/10 x 6.6 x 5’ and 1.2 m/4’ deep. It has several large protein skimmers, two nitrate reactors and it's lit by several high-powered metal halide lights, plus more than 40 T5 tubes. Three computers give the aquarium total automated control. There are two large refrigerant coolers and a 2,000 l/440 gal per day RO unit. The tank is stocked with some stunning LPS and SPS corals, including fabulous Trachyphyllia and red Goniopora and some unusual Tri-colour tangs –Scopas tangs that unusually display patches of black, white and yellow on their bodies. Some difficult species, including Cleaner wrasse, dragonettes, pipefish and anthias, are doing really well. There are jawfish in the substrate too. This enormous 'sunken garden' created by Nature exhibit design consultants Green Chapter, is created on an exclusive residential property in Malaysia. At 40,000 l/8,800 gal capacity it really is a dream tank. 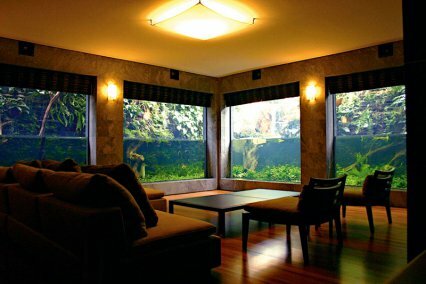 The combination of 100% natural daylight, open air and lush terrestrial planting overhead makes this aquarium all the more special. It includes hundreds of Anubias barteri, Anubias nana, Java fern, Echinodorus (oriental, rubin, barthii, parviflorus), Aponogeton (crispus, undulata) as well as thousands of stalks of Cryptocorynes (wendtii, blassii, pontederifolia and balansae). The land plants and a planted tree provide some shade and, coupled with a 2m/6.5’ waterfall and frequent breeze, the water is naturally chilled at around 26C/79°F, even under full sun. It's home to hundreds of South-East Asian Puntius denisonii, Six-banded tiger barb, T-barbs, Archerfish, halfbeaks, gouramis, Whiptail catfish, Borneo suckers and thousands of shrimps and Harlequin rasbora. There were 40 Tinfoil barbs but they had to be removed when they started to eat the plants. There's even a walkway constructed above the tank. The only items of equipment using electricity are the three main pumps that push water up to the filter chambers where it returns by gravity. There are five inlets spread out among the pond. The first filter chamber is a vortex, followed by a bio-brush, then ceramic rings with bio-matts. Maintenance is done twice a month by snorkeling in to clean the acrylic panels, prune the plants or insert fertiliser root tabs. Mark Howarth's amazing reef set up at Acropora House is so big that it's located in its own out-building. Computers control heating, cooling, pH, salinity and redox measurement and it's lit by 5 x 400w metal halides. Heating is by a titanium plate heat exchanger using the household hot water system. Cooling is by a titanium plate heater exchanger using an outside pond. Corals include numerous Acropora, Montipora, Stylophora, Seriatopora, Pavona, Pocillopora, Acanthastraea, Micromussa, Euphyllia, Blastomussa, Nemenzophyllia, Favia, Lobophillia, Echinopora, Duncanospammia, Trachyphyllia, Scolymia, Goniopora, Alveopora, Catalaphyllia, Cynarina, black coral, numerous sea fans, gorgonians, zoanthids, Ricordia sp. Other inverts include a Red carpet anemone, Fromia starfish, Linkia starfish, Sandsifting starfish, cleaner shrimp; blood shrimp; Peppermint shrimp; Tonga Nassarius snails; Mexican turbo snails and a Sifting cucumber. The tank is also home to a pair of Crosshatch triggerfish; two Powder blue tangs; a Foxface; a pair of Blue-lipped clownfish; three Tri-colour tangs; nine Scribbled anthias; a pair of Leopard wrasse; a Copperband butterfly; a Naso tang; two Purple tangs; four Fairy wrasse; 12 Bartletts anthias; a Candystripe hogfish; three Spotted mandarins and a Lavender firefish. 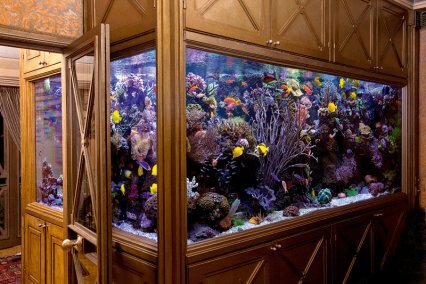 While we're talking big, we can't fail to mention the huge aquarium built by Jack Heathcote in the cellar of his house, to accommodate his collection of tankbusters. It is 381 x 388 x 213cm/12’6” x 12’8” x 7’ deep and is of the same size and footprint as his living room which is immediately above it. In fact, when sitting in the living room, looking between the floorboards you can see light escaping from the tank below. The tank holds 18,160 l./ 4000 gal. and is an L-shape from front to back, meaning that the space immediately behind the viewing window is 7’ deep; the rest of the floor space is subdivided by a ledge that used to be the foundation for the bay window. Three of the walls of the tank are, in fact, the foundation walls of the house. The viewing pane is made up of four 25mm glass panels held within a steel frame. The steel is 100 x 100mm/4” x 4” and goes deep within the brickwork on either side. The actual viewing space is 304 x 213cm/10’ x 7’ wide, much larger than most tanks, but bear in mind that at its widest point, it is also over 365cm/12’ from front to back. The inner brick walls are lined in polystyrene, then plywood, then fibreglass. The DIY filter is a 240 x 120 x 90cm/8’ x 4’ x 3’ box that Jack insulated and attached to the outside of the house. It is full of Alfagrog biological media and floss, and is run by two OASE Profimax 30,000 pumps giving a turnover of 60,000 lph. 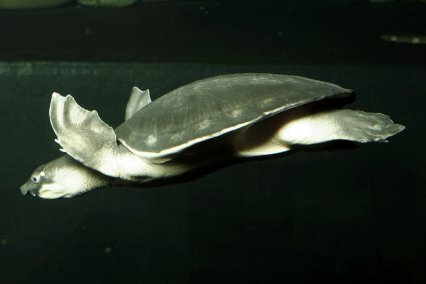 The tank contains Pacu, Pangasius, a Red tail hybrid catfish, a Giraffe cat, Giant gourami, Alligator gars, a Spiny eel, stingrays and two Fly river turtles. To maintain the aquarium, Jack dons diving gear and gets inside it. Now for something (much!) smaller, discovered for us by George Farmer, who writes: "Antonio Nikolic is a skilled aquascaper from Croatia, but this little beauty of his takes the nano tank to the next level. Antonio was collecting wood for his new 560 l/ 123 gal aquarium and noticed how the smallest twigs were suitable for a nano tank. He found some offcuts of 4mm glass and decided to make his own nature aquarium. 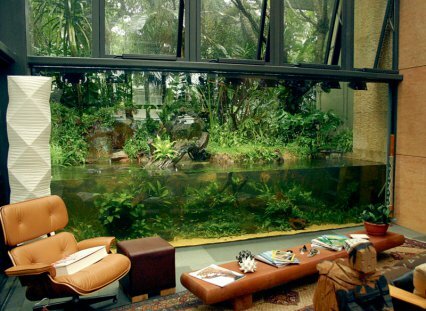 "All materials and plants were sourced from his main tank. Substrate is fine quartz sand. The rocks (large grains of gravel), were covered in Christmas moss (Vesicularia dubyana ‘Christmas’) using fine cotton thread. Phoenix moss (Fissidens fontanus) was planted as stem plants using tweezers. The tank houses a solitary juvenile Cherry shrimp (Neocaridina denticulata sinensis). "Antonio completed the look with an ADA-style cabinet, creating it using Adobe Photoshop and printing it onto photopaper, before cutting out and folding to create the finished result. Genius! The tank is just 8 x 4 x 4.4cm/ 3 x 1.5 x 1.6” (90ml) with a 70% water change daily, using the main planted tank water. Lighting is by a desktop lamp 12V, 20W, with an eight-hour photoperiod." We just adore this aquarium, aquascaped by James Starr-Marshall, inspired by one of Britain’s most outstanding coastal features. And it cost just £336 to set up. It was based on Durdle Door, a naturally eroded arch in the cliffs at Lulworth Cove in Dorset – and James managed to recreate it in a 16 l/3.5 gal tank. It's planted with Hemianthus callitrichoides and Riccia and benefits from the addition of CO2. The tank is stocked with Cherry shrimps and Phoenix rasbora (Boraras merah). 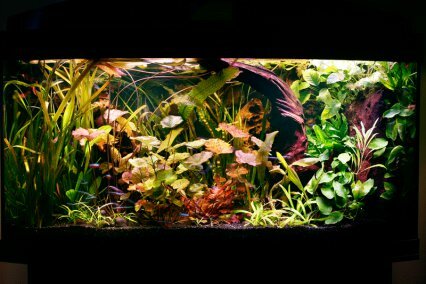 James entered the tank in the AAC international aquascaping contest and it was placed sixth out of 88 entries in the small aquariums category. We featured a step-by-step guide to creating this aquarium in the Christmas 2010 issue of Practical Fishkeeping magazine. Another stunning reef aquarium belongs to Polish reefkeeper Krzysztof Tryc. This state of the art ULNS system features a 160 x 80 x 55cm/63 x 31 x 22” display tank with 704 l/155 gal gross volume and 110 x 50 x 52cm/43 x 20 x 20” sump, giving a total volume of 750 l/165 gal. The colours of this tank’s 50 or so mainly SPS corals impact immediately and even our non-fishkeeping magazine designer said: "I can’t see the live rock." This is highly relevant, as on a proper reef there won’t be any bare rock. It should all be covered in corals and other inverts. The tank is lit using 720w of T5 tubes. Circulation is by two Tunze Turbelle Stream 6105 and two Iwaki MD55 combine to circulate 32,000 lph. An additional Red Dragon 8000 lph circulates water from the sump, giving 56 times total turnover. The peculiar planted aquascape shown above was on display at Singapore's Aquarama fish show in 2007 and it was receiving lots of attention. Aquascapers competed to win a coveted prize with both marine and planted tanks, and one of the criteria they were judged on was originality. This tank was named Night and Day, and the owner had tried to create an aquascape of two halves, the right side being day and the left side being night. To further enhance the day side a sun was created by tying Riccia fluitans onto a foam disc and sticking it to the back of the tank. Not necessarily to our taste but it is original thinking and we haven't seen anything quite like it since. Barry Cranwell's Discus set-ups certainly have the 'wow' factor. He has a Juwel Vision 260 and Juwel Lido 120, both with a 'jungle' feel to them. There was something about the décor and plant arrangement when we visited that put the two tanks straight into our list of favourites. The blend of Dennerle light tubes, floating plants and overhanging bogwood and plants gives the tank an even more mystical look as light and shade mix. Plants include Vallis, Aponogeton. Anubias, Nymphaea zenkeri, broadleaf Sagittaria platpyhylla, Java fern and various floating plants. Barry's fish include two Nhamunda Red wild Discus, two wild brown Discus, a wild gold Discus, 30 Cardinal tetras and six Dwarf black Corydoras. This reef aquarium was designed by Aquarium Architecture for a luxurious home in London. The tank is 3.2m x 1m height x 0.8m depth and holds 5,000 l. It's made from 19mm Opt-White glass and there's a granite-clad steel cabinet. 500kg of Fijian live rock was used in the set-up and the tank contains mostly soft corals with some LPS but no SPS corals, due to the nutrient level in the tank from the high fish load – there are over 200 fish in the tank. A built-in module emails weekly temperature and salinity readings. How much did it cost? Well, the light is a special custom built 2.5m Giesemann unit, which cost £8,000 alone. As to the price of the whole set-up, only Aquarium Architecture and their client know that, but our guess is to come up with a figure in your head and then double it!